Stop me if you’ve heard this one before. A corrupt L.A. cop (Woody Harrelson) makes bad choices, alienated and frightens his family, and looks to be on the way out as a career of taking the law into his own hands is at long last catching up with him. Yeah, you probably stopped me after the third word in that sentence. This dour character-study showcases Harrelson nicely as a cocksure cop who’s so self-destructive and paranoid that he pushes everyone away. Co-written and directed by Oren Moverman, who made the terrific and searing drama The Messenger, this movie just about turns into high-gloss navel-gazing. The plot is quite loose and there’s very little traction. We get to see scene after scene of Harrelson behaving badly or violent, but what does it all add up to? We already know he’s a bad cop tortured by his own sins and the demands of the job. In a way, there’s an intriguing connection between law enforcement and soldiers who are often called to bear incredible burdens and just deal with it, forgotten by a public complacent with being safe. But really this movie is just one long trip with an angry man who keeps everyone, including the audience, pushed away. He’s complex but I can’t say we ever got to know him better. The film is well acted with plenty of recognizable stars, but why should I care? 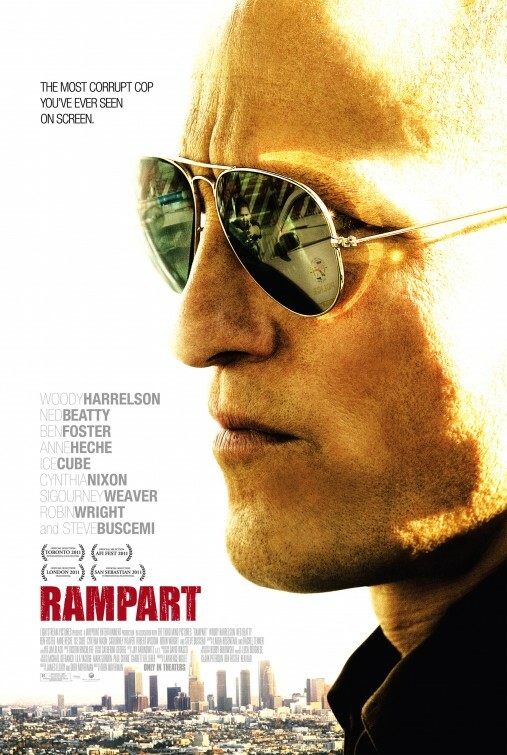 The central message about the prevailing influence of corruption is a bit heavy-handed as well; at one point Harreslon’s wife says, “You made us dirty.” Rampart is a disappointing venture for Moverman despite Harrelson’s best efforts. In the end, when you’re stuck with a dirty cop he better be worth the time. Posted on July 12, 2012, in 2012 Movies and tagged cops, crime, dark, drama, woody harrelson. Bookmark the permalink. Leave a comment.